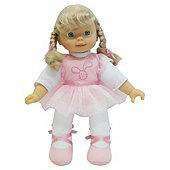 Emmi My beautiful ballerina is a 29cm soft-bodied baby doll that your little girl will adore. With a cute face and her hair in plaits Emmi wears a pretty pink tutu and ballet shoes with matching pink ribbons in her hair. Warning: Suitable from 3 years. It is back in stock right now! My order says 'created created' which is not a good sign with Tesco!! I am so sick of Tesco, just had an email cancelling my order, think this is the last time I order with them -useless! We're sorry, but we're unable to complete your Tesco Direct order ********. We work hard to make sure we have no problems with our deliveries, but in this case,we got it wrong. Just had my order cancelled, bloody tesco! What a ruddy lottery it is with Tesco's!